Details: Christine Ohlman debuts at 9 Wallis on the first official weekend of Spring in a night that will showcase favorites and never-heard duets (including an “unplugged” segment) with the legendary Jon Butcher. Ohlman, longtime Saturday Night Live (SNL) Band member, known as "The Beehive Queen" for her mile-high platinum-blonde hairdo and Butcher, a Grammy nominee and founder of "The Jon Butcher Axis” (Life Takes A Life and Ocean in Motion), promise to present an emotion-packed, soulful-to-the-bone, rockin’—and one-of-a-kind-memorable evening. 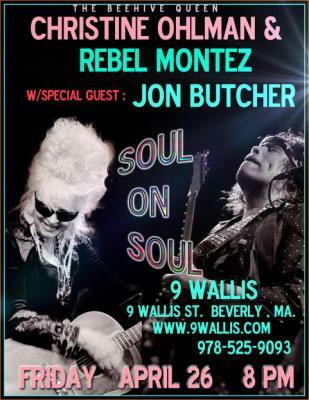 9 Wallis is one of the premier listening rooms in the Boston area...Be there with them and go soul-on-soul with two legends! There will be a special pre-show Meet & Greet with Ohlman and Butcher for the benefit of Guitars 4 Vets.